The apartments were very old and ours had an electric socket hanging off the wall. The corridors smelt of fish and were very dirty. Outside was pretty grubby too,(including dog poo)as it is situated on a very busy roundabout. Port Aventura is a short walk up the road. This was the most disgusting place I have ever seen. There was clumps of hair and nail clippings on the bed. Broken glass on the floor. My friends bed had blood on it and two brown streaks !!! ( dont think I need to explain this !!) I had to go out on the balcony to stop myself from puking. Please dont put yourself through this. Staying in the Royal with Self catering opens you up to eat whereever you like! There is a mass variety of bars and restaurants to choose from or you could just stay in your apartment. We found ourselves eating out most nights. Twice we got ourselves a chicken from the guy that cooks them from the side of a restaurant down the road and just came back and ate it in the room! There is also the Titanic Bar downstairs just situated at the Royal Apartments! We also ate at the Robin Hood, which is absolutely lovely and you cant fault the staff in there either. The hotel was clean and tidy for us arriving and there was maid service most days! i couldn't really fault the cleanliness of the apartment at all! 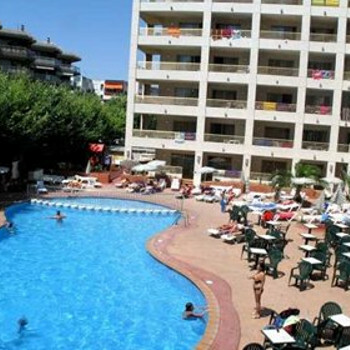 The royal is situated perfectly in the centre of Salou...Only 200 metres from the beach and a short walk to all amenities, and only about a 15 minute walk up to the theme park as well! The staff were absolutely lovely in the apartments, really friendly and would really go out of there way to help you! Then there was our Rep Simon, One of the loveliest blokes you will ever meet! I've met some nice reps in my travels but Simon really made the holiday what it was...Absolutely fantastic(even though it poured most of it). Down in the Titanic there is something on every night with the reps taking to the stage and taking the kids off to entertain them at night whilst the grown ups watch the show! Class act! I would definitely stay in the Royal again! It has a brilliant location. You can't fault it for much! I'm just glad that when Salou was flooded with the rain that I never went out in it because it floods quite bad at the roundabout that the Royal is situated on but usually clears up quite quickly! I'm not in anyway trying to put anyone off about Salou because you cant guarantee the weather anywhere! It was still a fantastic holiday! There is some areas of the apartments that can be a little noisy at night depending on which part of the hotel you are staying in though! Stayed in the Royal apartments and all I can say is what a dump. The apartments stink, were rarely cleaned. The staff were rubbish and the same goes for the Cosmos rep. He was useless. The apartments need a good makeover, paint falling off walls and rubbish everywhere. The rooms were disgusting. People turning up demanding to be moved because of the state of the place. The location can't be faulted, a little noisy but you expect it being near a roundabout and the nightclub Flashback. The best thing about the Royal is that the Titanic bar is right next door, brilliant food. The servings are huge and at good prices. The staff brilliant, esp Mandy, Toni, Greg and Chloe. The entertainment is good too. We stayed in the Royal Aparthotel which was basic but clean. The pool area was excellent with a large swimming pool for adults and a small pool for toddlers. The Titanic showbar below the apartments had poolside bar facilities which made it nice to stay all day. The food was excellent value for money. In the evenings at the Titanic bar there is live entertainment every night singer and comedienne Sharon day was fabulous Tubby Brown is a must. Simon the rep was more than helpful nothing was too much trouble for him. Nice pool and childrens pool with attendant on hand all day although he was a bit strict with regard to not allowing inflatables or children who couldn't swim in the main pool. Had to queue up till 10 am to gain access to pool and sunbeds but had no problem getting one. The Titanic bar is attached to the apartments serving drinks and snacks during the day and meals and entertainment in the evening. Very good food and something for all. With regard to entertainment from parrot shows for the kids to comedian "tubby" brown for the adults. Ideally located for port aventura(15 min walk) and all shops, bars, restaraunts. Hotel reception very friendly and helpful and Simon the rep always on hand each day. We were told before we went that you had to rent things like kettles and toasters so we bought a travel kettle only to find we had both in our room. There was some noise from the traffic and from the nearby nightclub but not anything to really keep you awake. The only time we were woken was when the night club was emptying about 5:30am because it is soundproofed when it is open. Overall an enjoyable holiday apart from a few days of overcast weather and a couple of heavy thunderstorms. Lastly, visit Tarragona about six miles away, 2 euros each on the bus, the old town is a great day out. Apatments - I arrived at royal at 4 in the morning and I got to say I was not impressed with the out side of the apartments it look old and dirty but check in was quick and to our suprise there was a man lying out side his apartment (wife kicked him out). There was silver fish in our apartment but over all it was CLEAN . Theme park - we got a 14 day pass because the theme park was to big to walk around in one day it is about a 20 minute walk from royal but it don't take long if you walk fast, there are some rides that I wouldn't dream of going on, but I went on! REP-simon was usless thats all I have to say. Apartments&Titanic-The apartments were very clean but a bit dull ,the maids were kind but watch out for the mad maid she will take your money etc and just chat a load of rubbish. The Rep Simon was usless and he could give you the right information,there was a fire in the titanic when I was there. The titanics food was nice but the chef is a tramp don't eat there on a night. The apartments were very spacious, we had a 2 bed, the balcony was at least 55 foot long, the kids played football and loved it. The hotel maids were lovely and provided clean towels every day. The appts could do with updating and a lick of paint but were more than adequate, large fridge (for your San Miguel) and freezer, cooker etc. The location was in walking distance of the beach the theme park and all the bars,however was a bit noisy if you wanted a nice in, consequently we only had one in 10 days!! The apartment is on top of the Titanic bar and the flashback night club is very near, so there was a lot of noise, but not that bad. We booked this accommodation with our local travel agent via Cosmos who have just started doing accomodation only, it was only 120.00 for 8 nights, we booked a hotel seperate for 2 nights on the besthotels website, this appt is also part of the Best Group of hotels, but you dont seem to be able to book it direct with them. You can find it on other holiday accommodation only websites though.